Join the CricHeroes squad today! 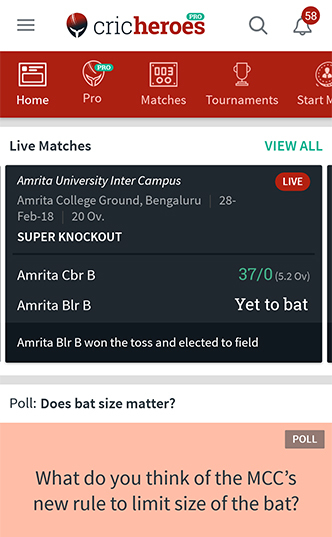 Stop using painful paper scorecards and score your matches on CricHeroes App just like an international match. 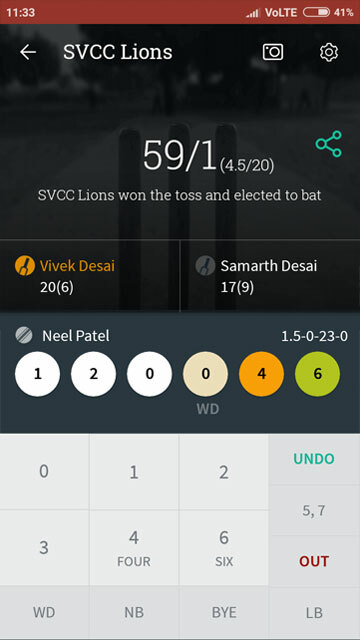 Share your live scores with the world and explore live scores of local cricket matches around you. 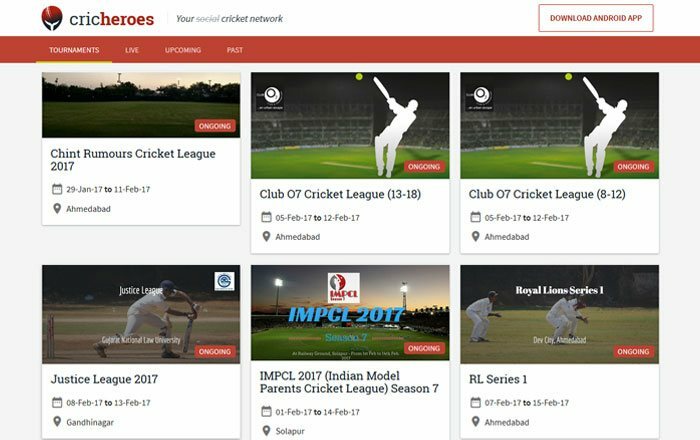 Score local cricket tournaments just like the IPL! Have your own dedicated Tournament Page with Schedule, Leaderboard, Points Table, Sponsors, and much more, completely FREE! 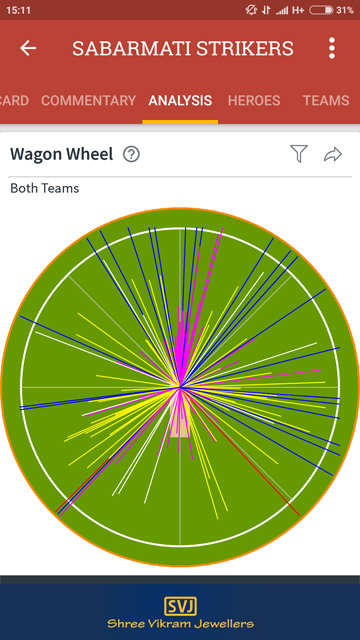 Scoring on CricHeroes is more exciting now with Wagon Wheel. Do give it a shot and become a better Cricketer. 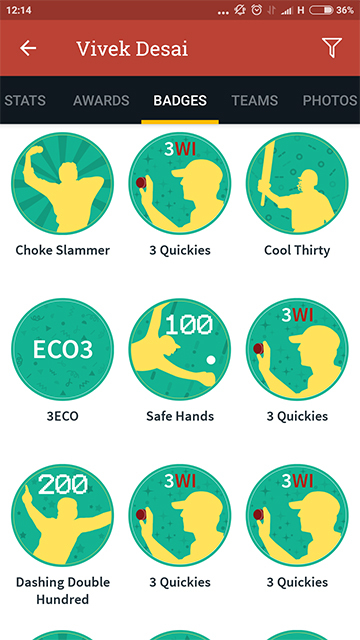 CricHeroes Badges is absolutely the most exciting way to recognise and celebrate your talent in Cricket. 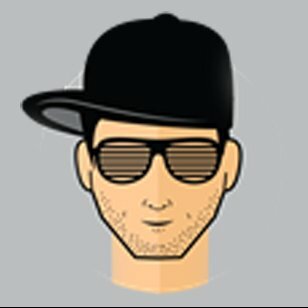 Unlock a virtual badge for your every cricketing achievement. 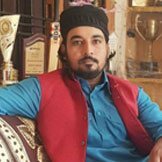 The most advanced Cricket Insights to know yourself, other cricketers and opponent teams better. CricHeroes offers three premium features mainly Power Promote, Super Sponsor, and White Label App. 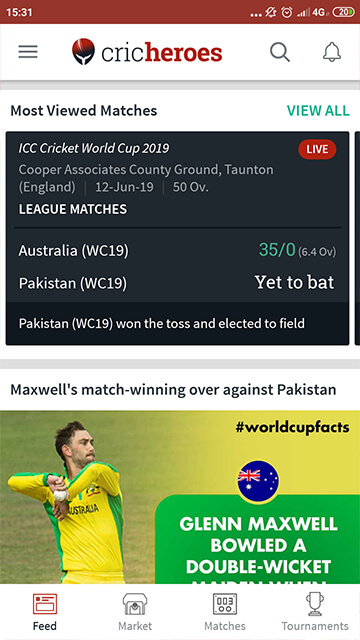 Your daily dose of Cricket - Enjoy Live Matches, Cricket Videos, Quizzes, Polls, Tips, Rules, Trivias, News and much more. 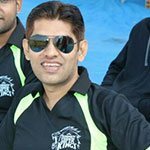 Find and book Cricket Academies, Grounds, Shops, Umpires, Scorers and Commentators for your Cricket needs. 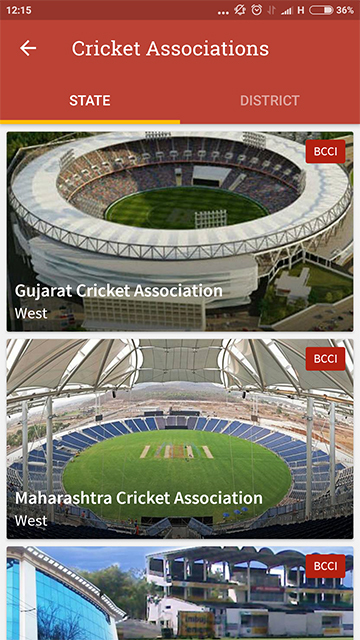 Score LIVE matches of State and District level associations on The CricHeroes App. Get a dedicated tournament page for all your tournament matches with your own branding (Tournament banner and logo). 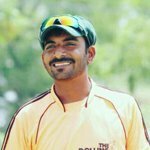 Show cricheroes of all past matches and tournament at one place. 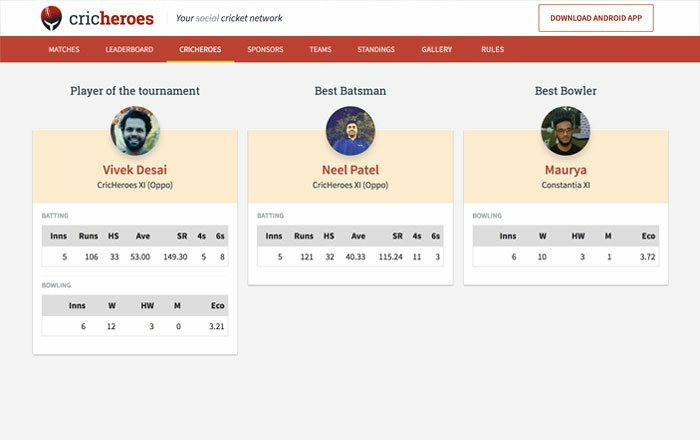 Get Leaderboard of Top Batsmen and Top Bowlers of the tournament. Give your sponsors additional visibility on the page. Show all participating teams and team members at one place. 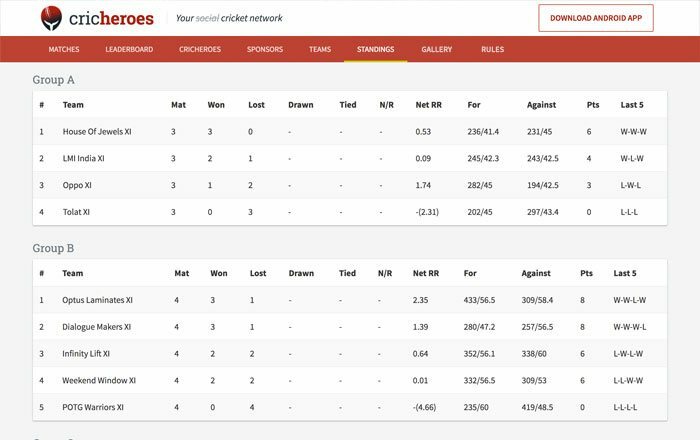 Get Standings (Points Table) based on standard BCCI formula for NRR. 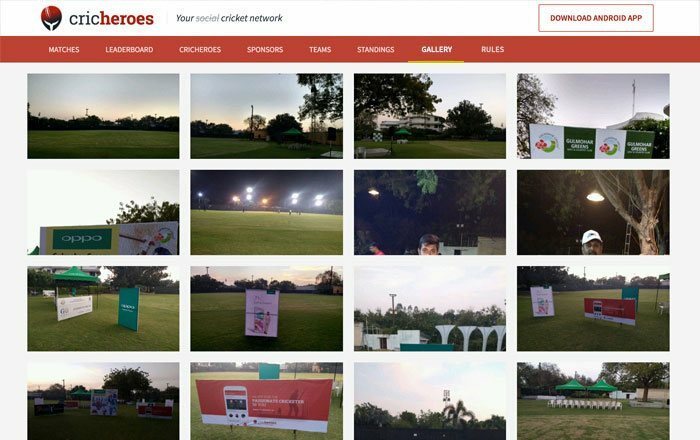 Give players chance to relive the entire tournament - All photos taken during matches at one place. 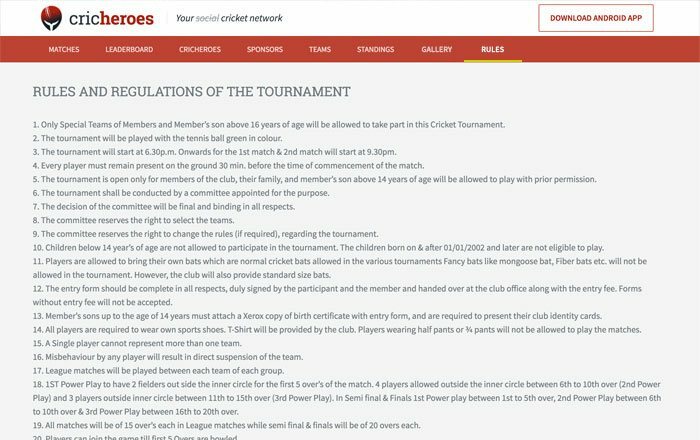 Put Rules of the Tournament on page. Promote your Tournament with POWER PROMOTE. Earn more from your Sponsors with SUPER SPONSOR. 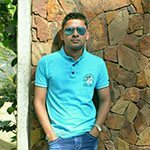 I'm very happy with your app as it works smoothly and accurately. 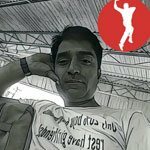 It is the best Cricket app I've come across so far. I liked the way you people respond as I spoke to 3 people from your team and got good response from all of you. 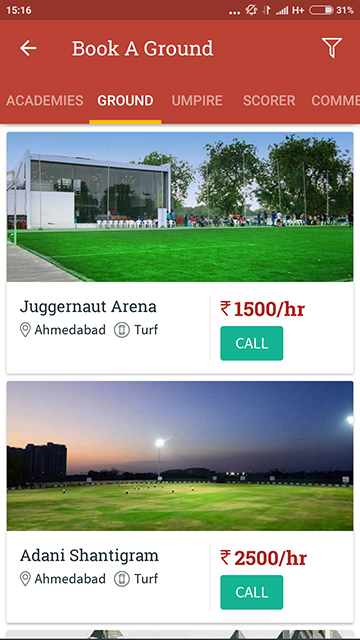 Your app is extremely good for all those who are playing local cricket. 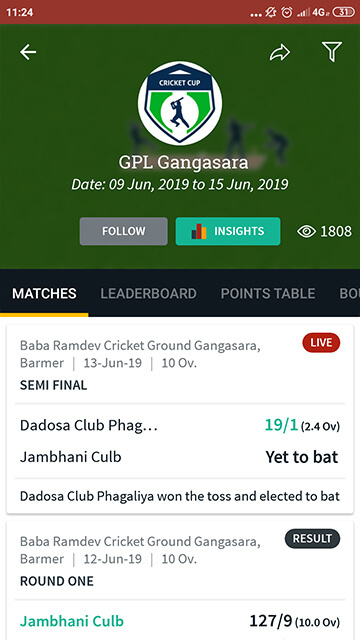 It is easy to use and broadcasts the score just like an international match. Very helpful to all those parents who can't come to see the match but can follow their kids' score being anywhere. 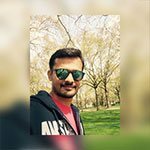 Its been a great pleasure to join with CricHeroes. 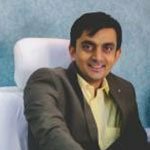 I have been getting good responses day by day since I have published my academy under your network. It’s a great work by you guys. Just keep it up and keep motivating others too. Wish you good luck. MCA Academy rates you 9/10 for your work. 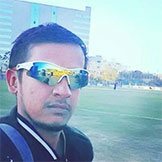 A player from Agra speaks his heart out for the CricHeroes app. 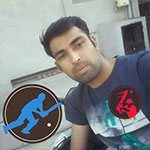 We are really thankful to CricHeroes. We play regularly and scoring and keeping records was too difficult and hectic. But after using the CricHeroes App, everything became so easy. CricHeroes is a extra ordinary application for the young cricketers & their parents. I will say It is better than cricbuzz or cricinfo because it is coving our kids & friends performance online. You can connect with game away from the ground ball to ball. We had Ultimate & Unforgettable experience in our 2 tournaments. Now I can't dream to conduct any future cricket Tournament without crickheroes. Big Thanks to Team-Crickheroes for making our HPL & Aravali Champions Trophy so special & unique !! 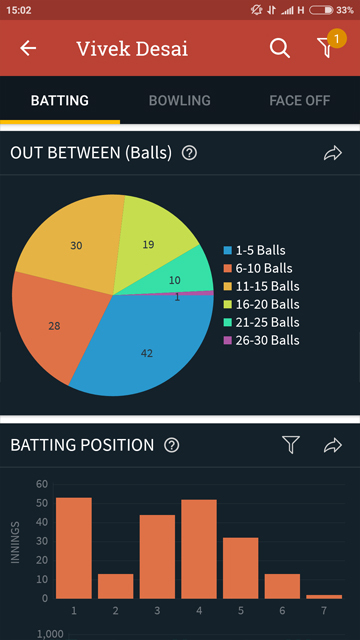 Cricheroes is a very impressive app for the cricket followers. It is no less than cricbuzz or cricinfo. We had used their services for one of our tournament. The app has all the details you would want. From match schedule to scores to player profile and what not. The staff is very courteous and helpful. They managed every match without any hurdles. Good going. All the best. 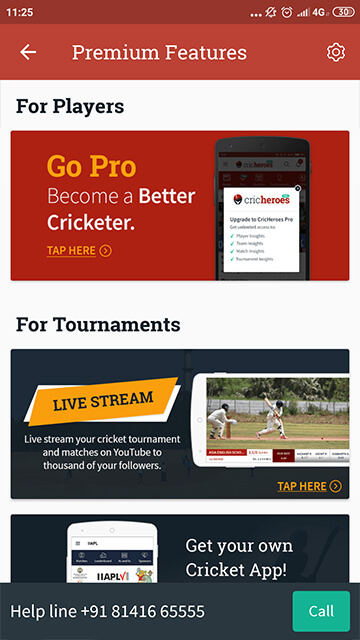 The CricHeroes App helped us create a wonderful cricketing experience. 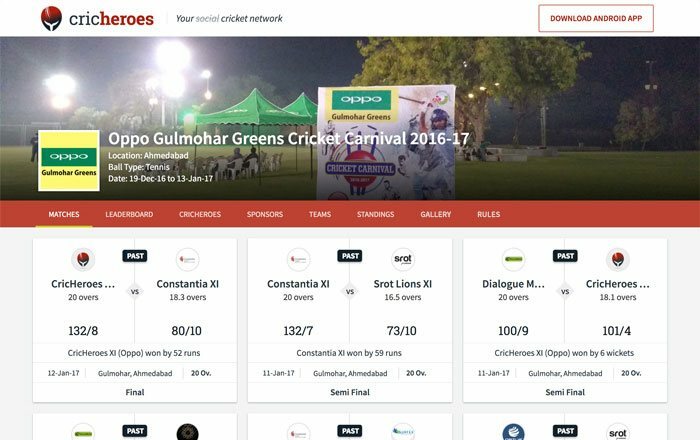 It was very responsive, user friendly and provided detailed analysis, which made our tournament exciting for the players and followers. The app is very modern in design and fast. I would recommend it as a must use app for all cricket tournaments. 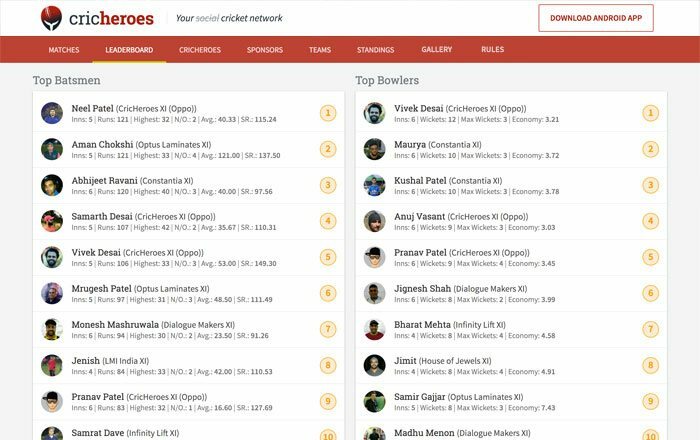 The CricHeroes App is a real hero for all local cricketers and fans. Not only it keeps them updated about all the local matches but it also features big clashes between their own friends and teams. 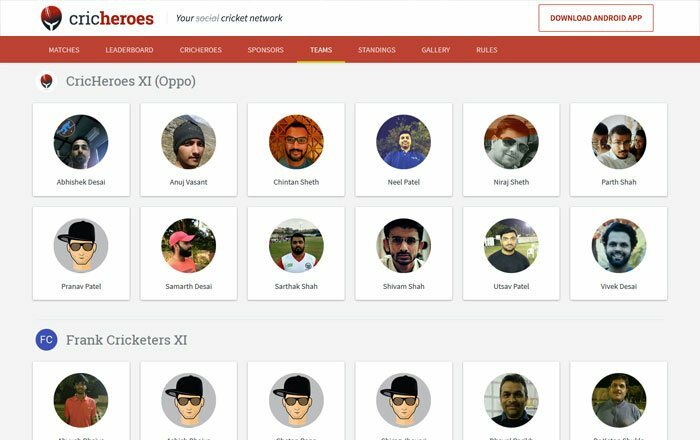 One of the mandatory app to be used by all cricketers and tournaments. 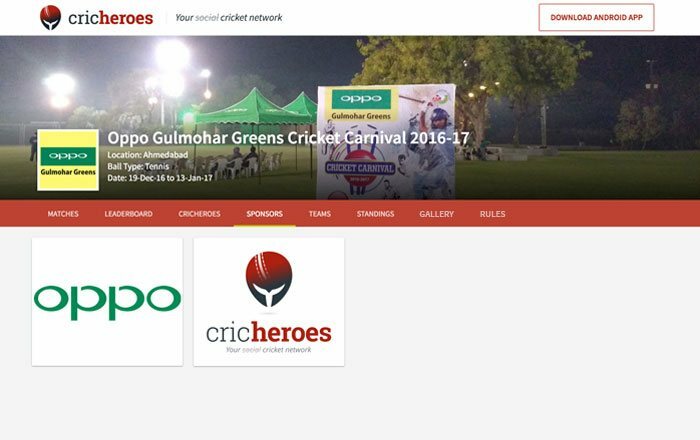 CricHeroes was a big help in making our cricket event successful. Scoring was done accurately and instantly. 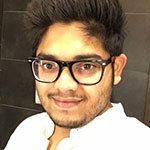 Thank you CricHeroes. 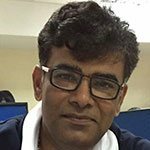 Tejas ShahChairman, Sports Committee, JIYO. Great experience for all....All doctors were happy and excited about application. Particularly your scorer was too good...on time and very well mannered. 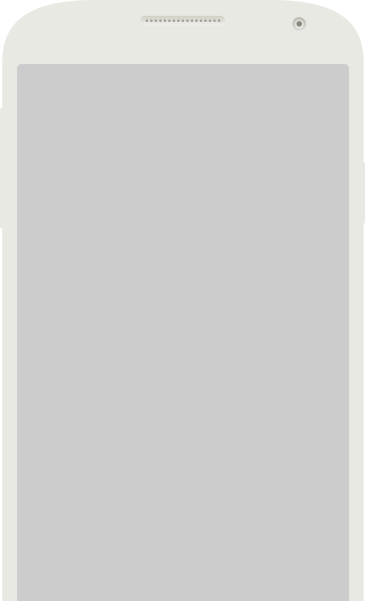 © CricHeroes Pvt Ltd. All rights reserved.